This article was just updated! You can view the new version here. Tablets continue to be some of the best selling CE devices. With new tablets coming out every few weeks, it’s hard to pick the best one. To make this process easier, I made the following chart. Most of the tablets in this chart are second generation devices which outperform their predecessors. What About the Kindle Fire? You probably noticed the Kindle Fire and Nook Tablet were omitted from the chart above. This was done for two reasons: First, it’s not fair to compare a $200 tablet with a $500 tablet. 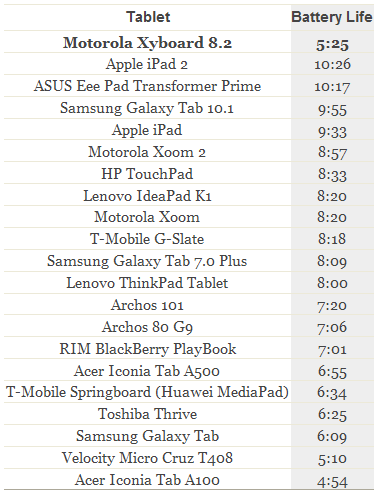 Second, the Kindle Fire, along with the rest of the tablets here, are not the highest performing tablets available today. Still, the Kindle is an exceptional value and I would recommend it to many people. I should also mention I stuck two of the Galaxy Tabs in this chart because there wasn’t enough room in the first chart. Both are top performers. So, What is the Best Tablet? When it comes to specs alone, the quad-core Asus Transformer Prime is hard to beat. It’s faster, thinner and lighter than the iPad 2. It also has a higher resolution display and much better cameras than the iPad 2. Furthermore, it has a slot for an SD card and a really nice keyboard dock that transforms it into an ultrabook. However, there’s more to the iPad than just specs. 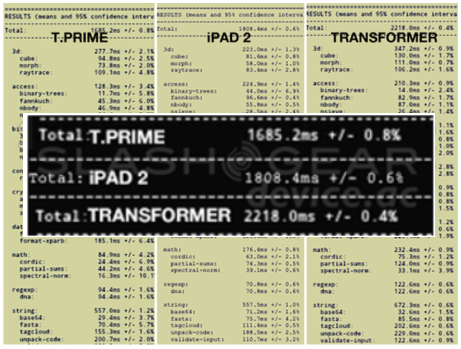 The iPad 2 beats the Transformer Prime in some graphic-related benchmarks as you can see in the chart below. The Motorola Xyboard 8.2 is a strong performer (as you can see in the chart above), but has issues with battery life as you can see below. The iPad 2 currently leads in battery life, with the Transformer Prime a close second. In the end, the only person who can answer this question is you. I suggest you first decide what you are buying the tablet for. Do you spend hours playing games? Will you use your tablet mostly for web browsing? Do you need blazing-fast data speeds? Are you willing to pay a monthly fee for this privilege? How important is battery life to you? Are you an Apple fan who wants to sync your tablet with iCloud? Once you answer these questions, you’ll find it easier to narrow down your list. Before making a final decision, I suggest you visit a few of the top tech blogs like Engadget or Gizmodo, and read their tablet reviews. I find them to be very helpful. Since great new tablets are coming out every month, I’ll be updating this chart on a regular basis. Expect to see the first update after I return from CES in January. Nice charts. One rather important error though is that the Galaxy Tab Plus 7 does have an IR emitter and the Peel remote control app. One of the features that makes it stand out from all the other tablets in its size range. Uncommon in all size ranges actually. Thanks for the feedback. I’ve approved your comment and corrected the error in the chart.